This is the third volume in the series Surveys of Recent Research in Economics. The series is intended to help busy academics and practitioners keep abreast of important developments that relate to, without necessarily being narrowly focussed on, their own more specific interests. This particular volume should be of interest to academic economists, political scientists (and, indeed, other social scientists), as well as practitioners engaged in policy-making and implementation. The contributions are accessible to advanced undergraduates and provide useful supplementary readings for a wide variety of courses in both Economics and Political Science. Stuart Sayer is Senior Lecturer and Head of the Economics Department at Edinburgh University. 1. 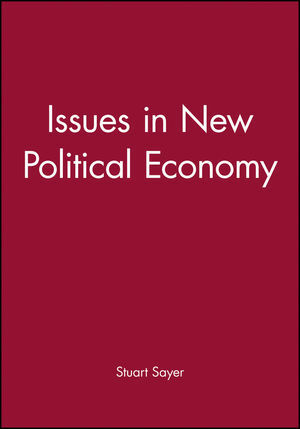 Issues in New Political Economy: An Introduction: Stuart Sayer (University of Edinburgh). 2. Political Macroeconomics: A Survey of Recent Developments: Manfred Gõrtner (University of St. Gallen). 3. Central Bank Independence: An Update of Theory and Evidence: Helge Berger (University of Munich), Jakob de Haan (University of Groningen) and Sylvester Eijffinger (Tilburg University). 4. Dependant and Accountable: Evidence from the Modern Theory of Central Banking: Gustavo Piga ( University of Macerata). 5. The Political Economy of Low Inflation: Jonathan Kirshner ( Cornell University & Harvard University). 6. Monetary Policy Rules, Policy Preferences, and Uncertainty: Some Recent Theoretical Contributions: Anton Muscatelli and Carmine Trecroci (University of Glasgow). 7. Social Capital: One or Many? Definition and Measurement: Martin Paldam (University of Aarhus). 8. Corruption: A Review: Arvind Jain (Concordia University). 9. Collective Action: Susanne Lohmann (University of California - Los Angeles). Index.